Until I learned to prepare them correctly, I hated Brussels sprouts. They were a limp, mushy and weird-tasting vegetable that immediately conjured up images of a sour-faced child or disinterested adult, sulkingly rolling it around on their plate without really eating it. 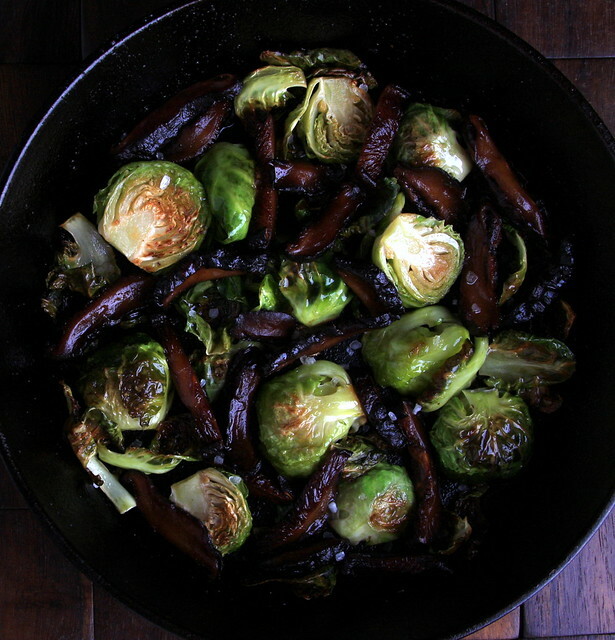 Like most vegetables that get a bad rap, the Brussels sprout is not inherently bad. But boiling or blanching coaxes out a flavor I don’t like, while roasting creates a sublime, smoky, popcorn-like aroma and allows a beautiful caramelization to develop around its cabbagy edges. Toss these with toasted sesame or olive oil, minced garlic and a few pinches of salt and roast to perfection, then throw in some shiitake bacon to create a salty, crispy and smoky contrast for a beautifully rustic and savory dish for the Thanksgiving table. Preheat your oven to 425. 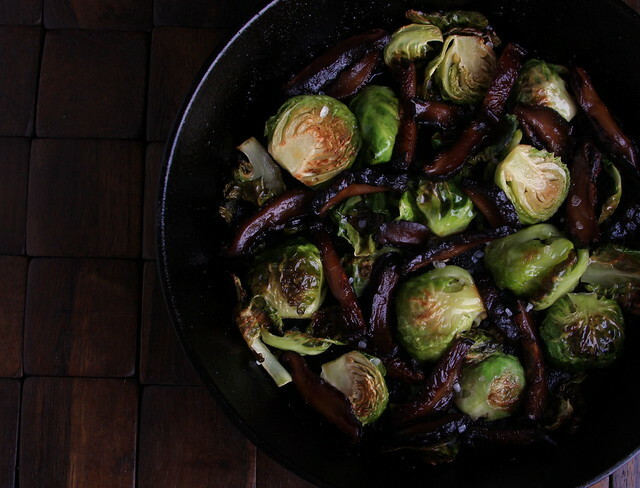 Add the Brussels sprouts, curved side down, into a cast iron pan or baking sheet and drizzle with the sesame or olive oil and salt. Roast for 10 minutes or until nicely caramelized on the bottom, flip, then sprinkle with the garlic, and roast for 5-7 minutes more, or until evenly roasted/caramelized on the other side. Toss with the shiitake bacon and serve warm or at room temperature. i just received a whole bag of these bad boys and i had no idea what to do with them! gonna try this! thanks ! yum yum, I love me some roasty Brussels! So glad you enjoyed, Leila! Shiitake bacon is one of my favorite things to make — the aroma alone is so amazing!